Throughout the generations Newport has had plenty of colorful bars, but probably none more colorful than the Snake Pit. The bar, which closed in the early 1970s, certainly earned that reputation. The bar was located in the basement of the Newport House, a hotel which stood on Newport’s Main Street between 1873 and 1973. It was located where People’s United Bank stands today. “The hotel was a nice place,” Carter said. For that matter, he and his wife of almost 69 years, Ruth (Besaw) Carter, believe their son Jim and his wife, Patty (Prue) Carter, who married in 1973, were the last couple to have their wedding reception in the hotel. Now 93 years old, Fred—a lifelong resident of Newport, most of it spent on the shores of the Clyde River on Clyde Street—told how he came about working at the bar. In his late teens, he was working with his father, Victor Carter, as a house painter, a job that Fred’s grandfather, Louis Carter, had also done. 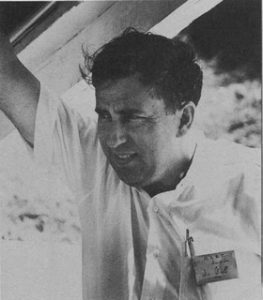 That’s when a friend of his, Wilfred Guyette, who worked at the Snake Pit with his brother Harland Guyette, offered him a job at the bar. “Wilfred said, ‘Freddy, you want a job, I’ll give you a job washing glasses at the Snake Pit,” Carter said. “Two or three days later I was told I might as well bartend too. I didn’t know what I was doing, but I learned.” He joked he occasionally sampled some of his alcoholic creations, but he wasn’t allowed to do any serious drinking on the job, and he certainly wasn’t to get drunk. Some people might wonder, with World War II raging, why Carter wasn’t off at war fighting for his country, or why he never went although he was old enough. As it turns out, he was drafted, but was rejected for duty because of his small size. He measured around 5 feet to 5 feet, 1 inch, and maybe weighed 100 pounds. With the start of the Korean War, he received another draft notice. Again he was rejected because of his size. On the other hand, because of his short stature and weight he was once recruited by the famed boxer Tony Galento to become a horse racing jockey. Carter said he met Galento because his brother Victor “Bombshell” Carter was a well-known local flyweight boxer. In response, Carter said Galento told him not to worry, horses wouldn’t hurt him, and he’d make a lot of money. No amount of money could convince Carter to go anywhere around horses, big money or not. He does wonder if he’d taken up Galento on the offer whether he’d have led a much wealthier life, and not still working into his 90s. “I messed up a lot of times in my life, but I guess we all do,” he said. However, he said to this day he is still afraid of horses. About 75 years after working at the Snake Pit, Carter laughs about what his buddy, Wilfred Guyette, pulled on him when he first started working there. After Carter said he didn’t know, his friend told him to call up to the kitchen of the hotel and ask the cook, George Hayes, to fry up three or four orders of lamb fries. So, what are “lamb fries”? They are fried lamb testicles. Yes, at the time they were a delicacy in some parts of the country, but not here in the Northeast Kingdom. “The Snake Pit was really not much different than any other bar,” Fred said. It wasn’t anything fancy, just a place where people could order a drink or some bar type food. There were some fights, but nothing out of the ordinary. “If there was a fight I’d get the hell out of there,” Carter said. However, his wife humorously rebutted his words. Two or three years of bartending were enough for him, Carter said. He returned to the family tradition of house painting, a tradition he passed down to his sons, Jim and Mike. All three of them are still painting. 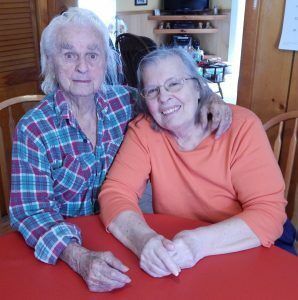 Ruth still remembers the day she met the swashbuckling little French–Abenaki man who she has spent almost the last seven decades of her life with. “It was Friday, June 13th, my 13th birthday,” she said. She was sitting on her family’s doorsteps on Bay Street in Newport when Fred drove by. He stopped and struck up a conversation. 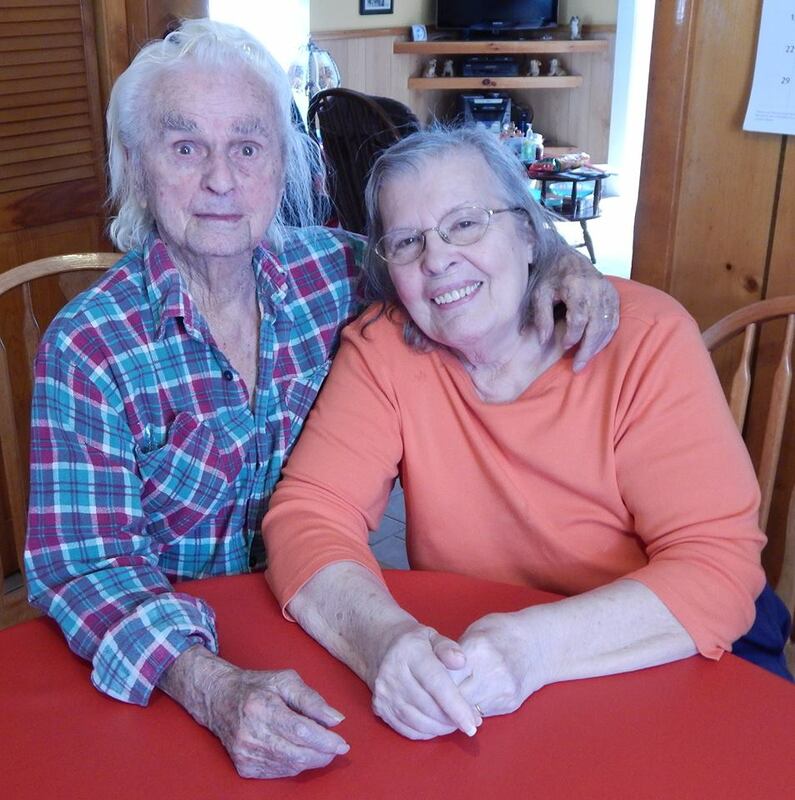 Later that year they met at a carnival that was being held at the fairgrounds where North Country Union High School is today and one thing led to another. They have been together since she was 13 and he was 23. The couple, who now have so many descendants that Ruth needs a calculator to come up with an accurate number, bemoan the demise of the Newport of their youth. They named off some of the stores, eateries, and bars that lined the street. There was even a bowling alley on Main Street. It was far from a perfect city, though, Fred said. 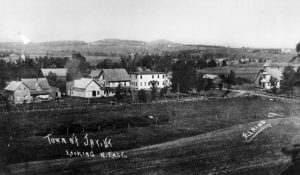 There was plenty of drinking, and a fair number of bar fights, and the smoldering city dump was located where part of Gardner Park is today, but it was an active community with a lot of spirit. They are so disheartened by the current condition of Main Street, especially the hole in the ground left behind by the destruction of the so-called Spates Block that stretched from Second Street to Central Street in 2015. With all said and done, though, the couple said the city has been good to them, and they have many fond memories of their life in the lakeside community. Some people think the Northeast Kingdom is in the middle of nowhere – a boring place where nothing happens. Don’t tell the U.S. media, or the worldwide media that, because, for good or bad, they are intrigued by this region of the state. I can’t count the number of reporters I’ve been interviewed by (or helped find subjects to interview) – including from the History Channel to reporters from such countries as Russia, South Korea, and a few weeks ago two reporters from the DailyMail out of England showed up at my door. Most are here for totally different reasons. I am now working with a group out of Australia who are producing a show for the Discovery Network. Their focus is on world famous scientists – their inventions, and where they are today. One person they plan to focus on is Dr. Gerald Bull. 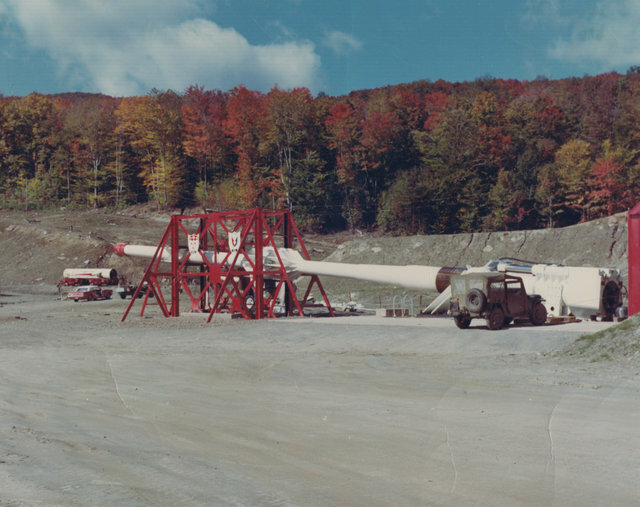 One of the test guns. Highwater, Quebec. 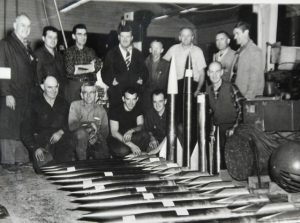 A wide array of munitions—long-range artillery shells and big guns and cannons capable of delivering their deadly cargo with pinpoint accuracy—were developed and produced there and sold around the world. SRC also conducted research and developed technology for many peaceful purposes, including space missions and to help air traffic controllers better do their jobs at airports around the world. His team also worked to develop technology to help shoot down incoming intercontinental missiles. To make a “LONG” story short, a story I have written extensively about, Dr. Bull was assassinated on March 22, 1990, apparently by the Israeli secret service – the Mossad. It is believed that he was taken out by the Israelis because he was helping then president of Iraq, Saddam Husain, produce an enormous supergun built against a mountain. If completed, the gun would have been able to lob artillery into downtown Tel Aviv in Israel. These are some photos of SRC. 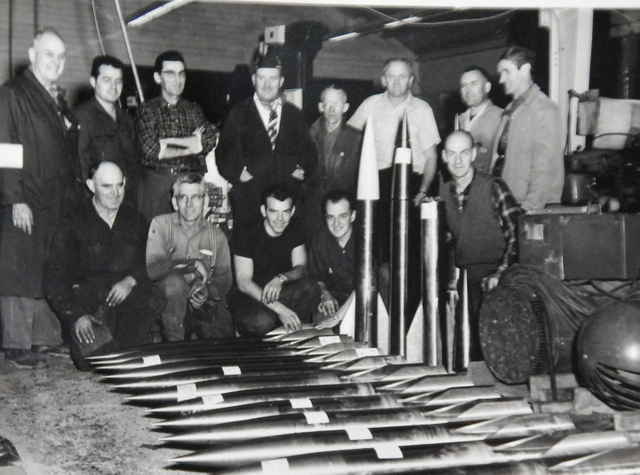 Some of the munitions produced at SRC. Yes, stories abound here in Vermont’s Northeast Kingdom. Mark was probably right. Nobody in their right mind would create a magazine dedicated to telling the history and stories of such a sparsely populated, economically depressed region of the state. But that is just what I dreamed up—to build a magazine dedicated to sharing and preserving the nitty-gritty real history of the region. Although I love the Northeast Kingdom, the land of my ancestors, I refuse to whitewash or romanticize the history of the region to make it more palatable. We also serve as a forum for people, particularly our seniors, to share their memories. Although I was a writer, I had no business background and no concept that such a magazine would fail. Nine out of ten people I mentioned my idea to insinuated, or outright told me, the magazine would fail, if not put me into bankruptcy. My wife, Penny Wheeler​, who I’ve now been married to for more than three decades, believed in me and my mission, though she was probably as oblivious to the realities of such an undertaking as I was. She simply knew I believed in the mission. I did find one person besides my wife who believed in the idea of the Journal. When I was a reporter with the Chronicle, I met Gary Kellogg​, a Midwestern boy who’d only been in the Kingdom a short while, assigned to manage Citizens Utilities in Derby. Gary fell in love with the region, its people, and its history. He instantly loved the concept of the Journal. Although Gary now lives in Arizona, he is still a firm supporter of, and a subscriber to, the Journal. He also took a piece of the Kingdom west with him when he moved. During his time in the Kingdom, not only did he fall in love with the region, he met and married his wife, Kathy (Gray) Kellogg, a Holland, Vermont, native. We are all still great friends. I’m not a betting man, so I guess I didn’t want to admit the odds were against me. Again, I had no business background to warn me this business venture was likely doomed from the beginning. Fast forward in time. With the publication of this issue of the magazine, the Northland Journal celebrates its 15th birthday. Just think, that’s 15 years of doing what I absolutely love. During that time we have recorded hundreds of stories. No, it hasn’t been an easy ride, and I occasionally still think I was nuts to undertake such an endeavor. First born as the Kingdom Historical, I changed that name 20 months into our adventure when I realized that many people have a dislike for history, at least the way it is too often taught in schools that makes one’s eyes glaze over from boredom. The more generic title, Vermont’s Northland Journal, arrived on the scene in January 2004, with the motto “Memories and Stories from Vermont’s Northeast Kingdom and Beyond.” My hope and belief is that the Journal has been able to put local names and faces to historical events—whether it be Prohibition, the Great Depression, World War II or other events—and make what might otherwise be seen by some as boring history, far more interesting. Also, I hope it has educated people about this beautiful region of the state and possibly even instilled pride in its rich history. Although I might be the public face of the Journal, in many ways I am only a tiny part of it. Instead, I surround myself with amazing people, a team that not only believes in the mission of the Journal, but people who also love the Northeast Kingdom—its beauty, its history, its people, and its future. Of course there is my wife and co-publisher, Penny. She does a tremendous amount of valuable behind-the-scenes work on the Journal, in addition to working full-time as a pharmacy clinical analyst at North Country Hospital. She is great at juggling her life. Our daughter, Emily Brugman​, is our office manager. Like her mother, she is super organized and pays close attention to detail. We are blessed she decided to join the business after college. Jeannine Young​, our editor and owner of The Little House Desktop Publishing, has been with us for almost the entire history of the Journal. We first met when we worked together at the Chronicle in Barton. Not only do we value her editing skills, but her wisdom and guidance is second to none. Bill Alexander​ has been associated with the Journal for more than a decade. As the owner of Alpine Web Media, he maintains our website and provides a wealth of guidance when it comes to the ever-evolving world of social media. Thomas Lichtenberger​, owner of Lichtenberger Design, designs the covers of the Journal, and he makes many of the ads. He also jumps to the rescue in multiple other ways when needed. numerous publications. Her work is so important to the Journal because we rely on our advertisers to help keep our mission alive. Amy Ash Nixon​ of Kirby is no stranger to the Vermont writing world. In addition to contributing to the Northland Journal, she is a reporter for The Caledonian-Record in St. Johnsbury. Sylvia Dodge was born and raised in St. Johnsbury. She is a licensed Vermont School Counselor and has worked at Lyndon Institute and Craftsbury Academy as an advocate for disadvantaged children and families. She has worked as a reporter and editor at The Caledonian-Record in St. Johnsbury and the Journal Opinion in Bradford, and was a frequent freelance contributor to Vermont Business Magazine from 1988-1995. We also have several other accomplished writers who periodically submit articles, including Beth Kanell​ of Waterford; Tanya Sousa​ of Coventry, Bethany M. Dunbar​ of Glover, and Barton native Dan Taylor​ of St. Paul, Minnesota. As important, are the ordinary people who submit personal memory articles of growing up in the Northeast Kingdom during an earlier time. Although not directly connected to the Journal, I can’t say enough positive things about my friends John Rice​ and Tod Pronto​. John is the producer of my radio show, Vermont Voice, and Tod is the producer of my television show, Northeast Kingdom Voice. I still occasionally wonder what I got me and my wife into when we gave birth to the Journal, but in the long run it has been worth all the stress. Our mission has never been about getting rich. For that matter, if my goal was to get rich, the Journal has been a dismal failure, at least monetarily. However, it certainly has made me rich in many other ways. As for the future of the Journal, we are going to continue to do what we do best—record and share the history of the Northeast Kingdom through the memories and words of the people who lived it. The Journal also plans to publish more books in the future. In closing, this issue of the Northland Journal is dedicated to Howard Frank Mosher​ of Irasburg. Howard, who died on January 29 at 74 years old, was the Northeast Kingdom’s best known writer, and he supported the endeavors of many aspiring writers. The monthly magazine is filled with stories of the Northeast Kingdom from an earlier time as told by the people who lived it. Each issue is also filled with historic photos of the region. The Journal comes in print and electronic versions. To subscribe to the Journal, send a check or money order for $25 (12 monthly issues), or $45 (24 monthly issues) to Vermont’s Northland Journal, PO Box 812, Derby, VT 05829. Or subscribe online HERE . You can also subscribe by calling: (802) 487-0254. Prices are based on delivery in the United States. Also check out our website HERE. As the publisher of Vermont’s Northland Journal, I get to learn so much about the ingenuity of previous generations. This is a tiny segment of an article written by Juliette “Julie” Leblanc Bourne who grew up in Jay, Vermont, during the first half of the 20th century. “Mother always had a huge garden, which she tended herself and it was always kept weed free. She was up early every morning. When the men went to do morning chores she’d weed the garden daily. People going by would remark on her garden. She canned just about everything, vegetables of all kinds as well as chicken, potted beef, and there was always salt pork. The butcher made the rounds in the summer every Friday with his wagon of fresh meat. Mother bought roasts or steaks for the weekend and the coming week. This meat was usually placed in large glass containers with covers and lowered into the milk tank which was kept cold with ice. The coldness of being submerged in the milk tank kept the meat fresh. Another practice that was quite common in the neighborhood is when someone butchered a beef, it was shared around as it was difficult to preserve. Of course this was reciprocated when anther family butchered a beef. Once winter set in was when most of the butchering of pigs took place as well as the beef cattle. This was because the meat could be kept frozen. The hams and bacon were smoked. I have often thought that the reason ham was the Easter choice was that it was most likely the last of the pork from the long winter. We certainly ate very well. Yes, we were poor, but warm and never hungry, and my mother was a good cook. I don’t think we knew we were poor. We had our own meat, dairy products, berries, maple sugar and apples. I welcome people to submit their own articles about life in the Northeast Kingdom during an earlier time. Email articles or questions to northlandjournal@gmail.com . Also consider subscribing to the Journal, a monthly magazine that helps share and preserve the history of Vermont’s Northeast Kingdom through the words of the people who lived it. To learn how to subscribe click HERE.